Due to fierce battles taking place there, the news has been filled with reports from the Lebanese town of Bint Jbeil (alternatively spelled Bint Jbail / Bint Jubayl / Bint Jubail). We have seen the etymology of the Arabic jabal, meaning mountain (and how it is connected with Hebrew gvul גבול). But what does bint mean? Bint in Arabic means "daughter" (and woman in British slang). As we've seen earlier this week, Hebrew words have a tendency to drop the letter nun. The word for son in Hebrew is ben בן. So the word in Hebrew for daughter should have been bint בנת as well, but the nun dropped out, and we were left with bat בת. 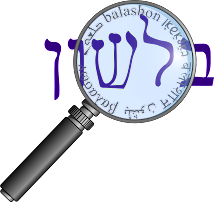 We still see traces of the "original" form in the plural - banot בנות. We see a similar phenomenon in Aramaic, where bar בר means son (as in "bar mitzvah") and ברת berat means daughter. What about the expression b'vat achat בבת אחת - "simultaneously, all at once"? Klein explains that it derives from a different meaning of bat. A bat (often rendered "bath") also was a liquid measure equal to one ephah איפה. Therefore, the expression originally meant "with one measure".